Overall size: 20" x 25"
The silence of the rugged Afghan landscape is broken by the shock and awe of British airborne forces. 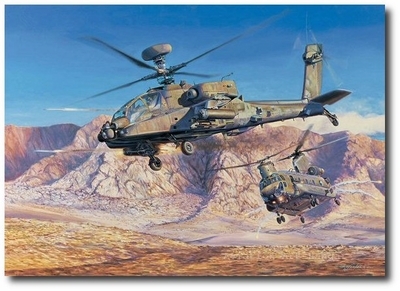 The path through enemy territory is cleared by the ferocity of an AH-64 Apache Longbow flown by the British 9th regiment. Coming in hot on the Apache's heels is a CH-47 Chinook carrying in British ground forces. 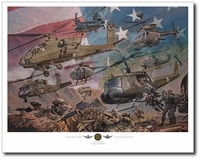 The original painting of Clearing the Path was commissioned by a corporate client of Rick Herters' and presented to the British 9th Regiment in honor of the unit's heroic service in Afghanistan.